This timely volume addresses urgent questions about the nature of war crimes, nationalism, ethnic cleansing and collective responsibility from a variety of moral, political and legal perspectives. Aleksandar Jokic is Professor of Philosophy and Conflict Resolution in the Graduate Program at Portland State University. He is Executive Director of the Center for Philosophical Education, founding editor of STOA - International Undergraduate Journal of Philosophy - and co-founder of the International Law and Ethics Conference Series. He is the author of Aspects of Scientific Discovery (1996), editor of the forthcoming From History to Justice (2000), and co-editor with Quentin Smith of Time, Tense, and Reference (2000) and Consciousness: New Philosophical Essays (2001). ...[T]he collection is clearly designed for course use, and its potential uses are apparent. The initial explorations on the moral origins and foundations of human rights law will be useful for instructors in laying the ground in the initial weeks of a course, before moving on to the historical development of concepts and practices of human rights. The history and debate on international trials and "transitional justice" offer a useful introduction or accompaniment to an empirical exploration of recent or ongoing trials. And the material on issues of collective guilt/responsibility/remorse provides a rich backdrop for investigations of the cultural and political dilemmas facing postwar societies. Instructors will also appreciate the additional material. The introduction to Anthony Ellis summarizes each of the articles while providing a road map to the controversies that divide the authors. And the editor, Aleksandar Jokic, provides brief essays at the end of each section which highlight the important points of each article and suggest further reading. In general, this is an enlightening and provocative collection. Jokic performs an important service by reminding readers that the political current toward the inclusion of human rights in international governance relies on philosophical and moral postulates which are far from settled, and offers a collection of essays which outline well what the controversies are. Teachers and instructors will appreciate his having gathered the material in one place. Researchers and activists will be grateful to Aleksandar Jokic for organizing this collection which helps to remind them why they do what they do in the first place." Brings together 14 newly written essays from a distinguished list of contributors. 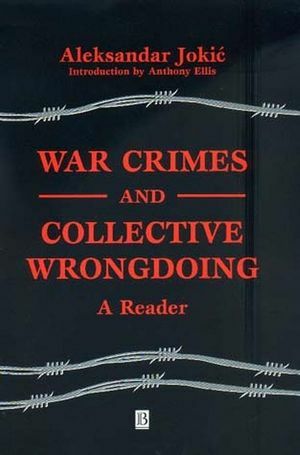 Truly interdisciplinary approach emphasizes the political, philosophical and legal aspects of war crimes and collective wrongdoing. Includes an introductory essay by Anthony Ellis. Each section is followed by an afterword and suggestions for further reading.